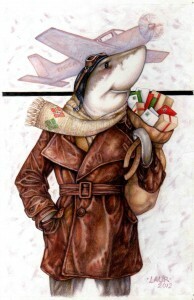 You are currently browsing the Laurie Klein Art — Laurie's Place blog archives for December, 2012. Introducing The Gnus. Or Gnu’s News. Or perhaps, New Gnus. The possibilities are endless (and to think i almost made this illustration a newt). Several months ago i added a few new images to my web site and wanted to create some sort of notification about the additions (so that old fans of the site would know to go and check it out). Originally there was an idea of making a special, dedicated page for New Stuff and i started thinking of a visual play on the word News with the idea of using a newt or a gnu as the “spokesperson” (spokesanimal?). 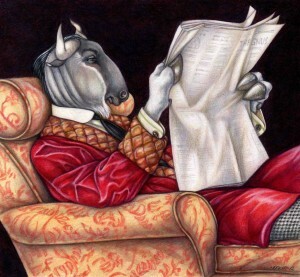 A gnu, reading a newspaper, immediately came to mind and for some reason i imagined him in a smoking jacket (i mean, really, who doesn’t think of smoking jackets when one contemplates a gnu reading the paper)? And i knew exactly where to go for a reference – J C Leyendecker and one of his Arrow Collar advertisement illustrations (i have long admired his style and was just waiting for the right confluence of inspiration to create my own homage)! “What’s Gnu” was. literally, whipped out in one day… And three months later still actually hasn’t found a home on my web site. With the exception of adding a “What’s New” category to the blog i never could really find a way to make my Spokesgnu (Gnusman?) work for its intended purpose (announcing the gnu stuff) so he has been languishing on my Facebook page in the form of my profile picture and banner. Until today! (NOTE: Well, okay, in the interest of full disclosure, the idea of using him as the lead-in to a What’s New blog post came weeks ago, i just never quite got around to writing it). Today Gnu finally gets his day in the sun. Or rather, on the site. With more to come in the months ahead (fingers crosses. Knock on a tough, fibrous cellular surface. Kiss a chimney sweep) – as a regular blog feature introducing whatever new things have recently been posted. And so, without further ado and extraneous preamble – on to The Gnus! Under BOOKS – you will find my newest children’s picture book – “Solar System Forecast”. As well as new links for convenient on-line purchase of all my other books . Under MURALS – i have posted photos of the Crookshank Elementary School cafeteria mural (a multi-wall painting of all the continents, including select native animals and travel posters of hi-lighted cities/monuments/features). Under CONTACTS – one can now link to my Facebook art page (where Gnu will again guide you. At least until i change my profile picture and banner). Granted – it’s not a lot of new stuff – but it’s still worth noting. And this finally gives me a chance to share the story of Gnu with you. Who (rhyme unintended) will himself feature as a New web site item very soon. Along with this year’s annual Christmas card, which shall be posted just as soon as i’m finished with it. NOTE: By way of a little spoiler – the card is linked to Gnu which is why i felt compelled to post this blog today (otherwise, when i post the Christmas card, its background story won’t make any sense).